Make every day an adventure in scenic Holland, then fall in love with romantic Paris! 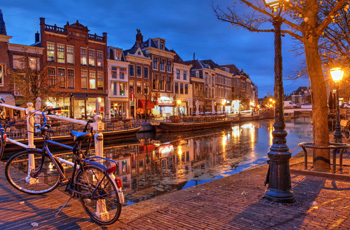 One week each in personally selected apartments in Leiden, Holland and Paris. Airport transfer assistance upon arrival and return. Orientation sessions with our local staff in each destination, to help you settle in and plan your time. Holland: A 5-day Benelux Rail Pass (good for the Netherlands, Belgium, and Luxembourg) and limited bus/tram rides for ground transportation within Holland. Paris: 20 single ride metro/bus tickets and a 2-day museum pass that gives you free entry to most major museums, allowing you to skip admission lines. Transfer between destinations: Second class rail ticket on nonstop, high-speed Thalys train from Schiphol Airport to Paris, with transfer assistance for Paris arrival. Local info, a Paris street atlas, and Untouring Paris and Going Dutch guidebooks, both researched and written by Untours staff, full of insider tips and sightseeing suggestions. Cultural events in each location, like a restaurant dinner in the Latin Quarter of Paris, and Dutch fun, like a guided tour of the Peace Palace in the Hague, an Amsterdam walk, or a Pannekoeken (Dutch pancake) lunch. Use of an Untours cell phone while on location in each destination. A small stash of groceries upon your arrival in each apartment. Pre-trip planning advice from our staff, available by phone or email up until you leave. Ongoing telephone support from our on-site staff. Help available when you need it.